The principles of successful investing are, so I gather from my extensive reading, pretty simple. Pick your asset allocation, making due allowance for your risk tolerance. Invest passively in it, optimise for tax and minimise fees, rebalance regularly – annually is often enough. Job done. Resist the temptation to tweak your allocation, trade within it or even look at your portfolio valuation . Of course I’m not the only blogger who knows the principles yet ignores them in certain practices. But I certainly respect the principle of sticking to your asset allocation. One of the benefits of having a consistent allocation and rebalancing against it is that this enforces a ‘buy low sell high’ behaviour. Taking fright at, for instance, the Australian market underperformance and lowering your target exposure to the Australian market is exactly the wrong thing to do. So, please believe me when I say that I take changes to my asset allocation very seriously. But nonetheless I am making one – quite a big one – and I’d be interested to have my thinking challenged. The trigger for updating my allocation is that I am about to take out a significant loan backed by my investment portfolio. This loan is to allow me to bridge a property purchase while minimising the amount of my investment portfolio that I need to sell. In theory, because my returns on this portfolio are, after tax, generally at least three times the cost of the loan, this strategy makes sense. But it is risky, because my returns will be leveraged by this loan. The loan is going to be about one third the size of my investments, which means that a 2% change in the value of the investments will make a 3% impact on my net equity value. Relative to typical housing leverage, this is tiny, but house price volatility is a lot lower than stock market volatility. This leverage increases my risk and I want to alter my asset allocation to reduce my levels of risk, in mitigation. What allocation reduces the risk in my investment portfolio? The obvious answer to reduce risk is to tilt the portfolio more to cash and bonds and less towards equity. I don’t believe in cash as an investment asset, which leaves bonds. Bonds however feel more risky than usual at the moment, with an enormous bull run behind them, and interest rates just starting an upwards march for the first time in 9 years. Nonetheless, the chances of bonds falling by 20% or more are much lower, to my mind, than the chances of the equity markets falling this much, so bonds are lower risk. And in fact A Wealth of Common Sense tells me that a (US) 60:40 portfolio has never suffered an annual loss of more than -14%; I could cope with worse than this and not fall out of my leveraged bed. But as I’ve been reflecting on my risks over the festive break I think I need to radically prune the UK equity exposure in my portfolio. The UK’s share of the world market. I’ve finally read Tim Hale’s excellent book – Smarter Investing – who lays this argument out very effectively. 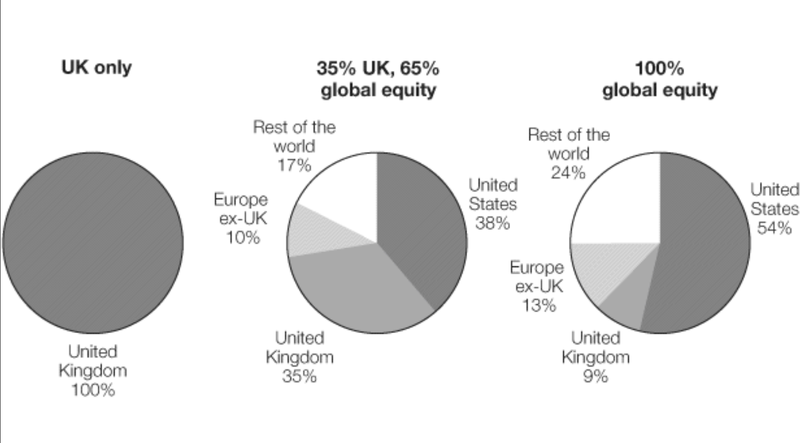 The UK is about 5% of global GBP and 10% of the global stock market. Even allowing for home bias – which I proudly sport – my current allocation of 55% to the UK feels far too high. The concentration within FTSE-100. The top 100 FTSE companies, FTSE-100, are over 80% of the UK stock market. And FTSE-100 is disproportionately skewed towards three sectors – commodities, financial services and pharmaceuticals – and away from technology. This skew almost singlehandedly explains FTSE’s fall in 2015, with commodity stalwarts like BHP, Anglo American, BP, Glencore and Shell losing 30-70% of their value, and there being no FANG (Facebook, Amazon, Netflix, Google) companies to make up the difference (pace Betfair, up 150% in 2015). I am aware that this argument is akin to selling something because it has fallen but I still feel the argument is a real one. Brexit and pension risks. The UK faces the prospect of at least one (and perhaps two) existential referendum later this year. This event creates enormous uncertainty, and markets dislike uncertainty. This could hurt equity valuations, business confidence, the pound, or some cocktail of all three. On top of this there is the prospect of one of the largest reforms to pensions ever, which bodes badly for the asset management sector in FTSE (such as Legal & General, Standard Life, Aberdeen, Prudential, etc). 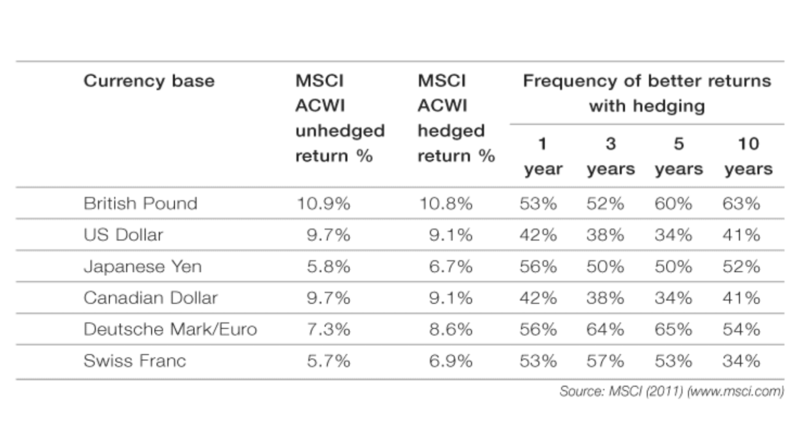 Potentially these risks are priced in, but volatility is likely either way. What are my alternatives to my UK equity exposure? Second only to my UK home bias is my bias for the US market. The US is about 25% of global GDP and around half of the developed market equity markets (see Tim Hale’s pie charts below). Its equity market, has a strong fiduciary / governance framework and I have a lot of experience of investing in it. In contrast the European markets are fragmented, frequently poorly governed, and inconsistently taxed, so they make me nervous. Australia aside, I have been barely interested in Asia at all since I learnt that stock market growth doesn’t correlate with GDP growth at all. The next point to cover is the bond allocation. I am quite taken with Tim Hale’s argument that to the extent that bonds are to provide safety, they should (for UK investors) be UK government bonds. To me this isn’t the whole story – bonds are also uncorrelated assets – but it does justify a home bias for fixed income. The final point to discuss is foreign exchange risk. Tim Hale argues (with data, shown below) that in general this risk balances out – sometimes you win, sometimes you lose. Certainly I am pretty comfortable taking UK/US forex risk. The Euro is harder to call and I wouldn’t go near any Asian / minority currency pairs. So overall I am going to treat GBP and USD as interchangeable, and see how I go. Having put a cold towel around my head I’m planning to move my allocation as follows. My Equity:Fixed Income:Cash mix is 2:1:-1. I.e. for £2m of equities, I’d have £1m of fixed income, and I’d take out £1m of margin loan, leaving me with £3m of gross investments and £2m of net exposure. This is a loan-to-value of 33%, which I feel comfortable with. And it is an equity:bond split of 66:34 which is considerably more conservative than my current 84:16. Australia remains at around 5%, which is roughly the amount of my life I spend there. I struggle to find good investable assets (except for commodity businesses, which are a brave call right now) in Australia, or else I’d have this a smidge higher. The UK and US are 75% of the investment total. This is home and US bias. But this percentage is closer to the share of global stock markets than it looks. 75% across both is only a bit lower than the 80% I had before. This leaves ‘International’ as the balance – 20% – which is slightly higher than the amount of my life I spend there but not by much. The vast majority of International to me is in the Eurozone. Within UK/US, the UK is slightly bigger. I’ve been minded to increase the US above the UK. But right now the UK is 55% of the net total for me, compared to the US at 25%, and I don’t want to throw the whole UK baby out with the allocation bathwater. Plus I think my UK bond holding should be bigger than my US bond holding. But this rebalance is getting the US close to 1:1 with the UK. My margin loan will be 50:50 GBP:USD. This means I’ll be borrowing in USD to help fund my UK house. This sound crazy, but I see it as diversifying my GBP risk. And it reflects the fact that margin terms are better for US investments. (Note – I’ve had feedback that this table, with negative cash percentages, is confusing. I’m glad I’m not the only one finding this confusing – don’t try this at home! But to try to make this clearer…. Consider a scenario before leverage: I have a £1000k portfolio, with £666k equities, £333k fixed income, with no cash. This has Equity: 66, Fixed Income: 33, Cash: 0. Right, that’s it. This is a big change – it will mean more than tripling my relative fixed income exposure, and quadrupling my US fixed income exposure, at the expense of my UK equity positions. What do people think? Too complicated? Too mad? Too risky? What would you be worried about if you were in my position? My worry is the margin loan. I was always taught to have assets and liabilities in the same currency. Therefore a UK house= GBP loan. Having a different currency loan exposes one to shifts in currency rates and could be catastrophic. @GFourmoney – thanks for this. I agree I was taught that too. I think the conceptual leap here is that the margin loan is not secured on the UK house asset; it is secured on the portfolio. And I can put the portfolio in whatever currency I like. Yes, when I draw the loan, it is in GBP, but if at that point I concert some of the GBP loan into USD, and convert the assets its secured on into USD, then henceforth I can have a mixed currency liability to match a mixed currency asset base. And the UK house is irrelevant. I think. Am I right? Don’t you crystalise the currency risk when you take out the loan, as you effectively transfer US asset value to UK cash? Thereafter you can either draw down the US assets to repay the loan, and decouple yourself from any $ forex movements but leaving yourself underweight in the US, or repay incrementally in £, spreading the currency risk over years. But you are divesting US assets today, and planning to re-invest in the US in future, at whatever forex gains/losses and equity occur, so you are exposed to double risk. With Interactive Brokers, at least, the loan is extremely fungible between currencies. If you start off with $500k of US equities and £300k of UK equities, and $300k/£200k of loan, then you can at any point do a forex transfer between GBP and USD. So whether you view the security as the £300k of UK equities or $500k of USD equities is up to you. In principle with my other marginable account the same is true but forex is more expensive so you won’t move lightly from one t’other. Having benefited from earning $ at 2:1 and repatriating it at 1.6:1 I’m very conscious of forex risk, and the US equity market seems over-valued by CAPE measures. Why not go for FTSE small-caps? Rapid rebalancing introduces its own risks, do you need to do it now before you get the loan, or can you stage them more? Your final table is confusing with its negative numbers. it would be clearer if you had real %ages, and included a property column. Otherwise I think it looks reasonable, I guess my only query would be on the International side – whilst the UK / US (I would even add some of Europe, even despite the current risks) are great to provide a slow but steady growth, depending on how much you still need to grow assets / income would you want a larger share in the International side? I can’t add a lot as my HYP is now nicely setup and I am starting to rebalance (by adding more funds) to wider markets and balance things out. The only other thought is – are you likely to move home again in the near future (i.e. before you pay off the margin loan)? I know you werent originally planning on moving in the first place, but its always worth considering….! @London Rob, @John Bray – many thanks for your comments. I take the point that negative cash allocations are confusing. You should see Interactive Brokers’ margin reporting – which is doing my head in. But I’ve amended my post to try to explain more clearly. @London Rob – I have no intention to move again in the near future. And it will take a while to recharge the coffers to afford suitable stamp duty, if such a move is in the UK. My life isn’t that easy to foresee as you can tell but the Former Dream Home has lasted me 14 years so hopefully I will get the same lifespan out of the new Dream Home! Your point about International is well taken. But there is no reason to think International will grow faster than UK/US, that I know of, other than that they are higher risk and thus command higher return – and right now I want lower risk thank you very much. Stock markets do not correlate to GDP so high GDP growth countries do not have high return equity markets, alas. That makes more sense, and as you say intending to move is not something that ever comes up, but then at the beginning of December were you planning to move? 🙂 Your point on the current Stamp Duty however is very valid – its a huge amount to find to pay out, and the thought of finding >100k GBP just for the privilege of moving isnt something that interests me! Very valid point on the International, for me its a bit of fun (although granted seeing my russian stake low hurts, but the divi at least compensates a bit!) – if you are in the slow and steady state and not working then I can understand why you keep it low!